LNG exports: what are the risks? What are the risks with LNG tanker traffic? LNG carriers are specialized tankers that carry natural gas (methane) that has been liquefied through cooling to -162 degrees celsius. Liquefaction reduces the volume of methane by a ratio of 600 to 1, making it easier to transport. A typical LNG tanker carries 60 to 80,000 tonnes of LNG in unpressurized, insulated tanks. As a liquid LNG does not burn; however, the gas cloud generated by evaporating LNG is flammable. If LNG were to escape from a tanker as a result of a deliberate attack or serious accident, gas cloud contact with an ignition source could result in a intense fire near the tanker. An LNG tanker fire near critical infrastructure or population centres could have catastrophic impacts on public health and safety. Further details here. While LNG tankers so far have an excellent accident record, LNG tanker traffic should be kept well away from communities and other marine traffic to reduce potential hazards to the public and isolate the tankers themselves from security risks such as deliberate attack. The public is not protected from the security and safety risks posed by LNG exports. Governments have not required the LNG industry develop a dedicated response organization, such as the one in place for oil spills. While the risk of a deliberate attack or serious accident at an LNG terminal or on an LNG tanker may be low, the consequences could be disastrous for our communities and critical coastal infrastructure. Government must play a leadership role in protecting the public against low probability – high consequence risks such as these, but BC and Canada have failed to do so. Without a comprehensive regulatory framework to guide LNG development, export projects are being proposed in areas that put communities and critical infrastructure at risk. This is unacceptable. BC should place an immediate moratorium on LNG export approvals until proper rules are in place to protect the public. LNG safety and security risks can be avoided – if government makes it a priority. Fortunately, much of the hard work of developing a regulatory framework for LNG safety and security has already been done in the United States and could be applied in Canada. Creating a robust preparedness and response regime for ship-source incidents involving LNG, and establishing regulations for LNG bunkering. 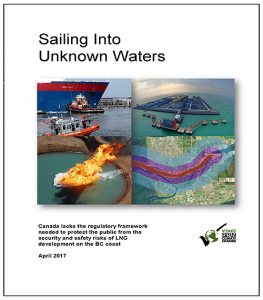 Learn more about the problem with missing LNG safety and security regulations by clicking on the report at right.